I have several Paleo books, including ones by Loren Cordain and Robb Wolf, two of the first people to bring the Paleo way of eating into more popularity in the past ten years; I have books on the concepts and science behind it, and I also have some great Paleo cookbooks (I’ll list them below in “Related Links”). The idea of Paleo eating is basically that of eating whole, nutrient-dense foods, good fats, and staying away from grains and refined products and sugars. There is a growing body of scientific evidence that the human body is not great at processing grains, as their wide-spread consumption only began with the agricultural revolution, which is actually just a blip in the millions-year span of man’s existence. The idea is that our bodies are not technically engineered to eat the foods [especially in the quantities] that we have become accustomed to eating (like refined flours and sugars), and that many of the illnesses that modern medicine is fighting to “cure” are actually caused by chronic inflammation in the body due to our poor diets. The reason there is more and more awareness about celiac disease, and the reason you see more “gluten-free” options on menus is because we are just now learning the symptoms of gluten intolerance, and how serious this issue can be; even though many people do not feel they have an intolerance to gluten, the vast majority of people who try a Paleo diet realize just how much it has affected them through the years once they have gotten it out of their systems. There are several variations in the Paleo diet depending on your own personal needs, but the gist of it is above, and I believe it is the way to truly fuel your body properly, in accordance with how our human biology seems to work. 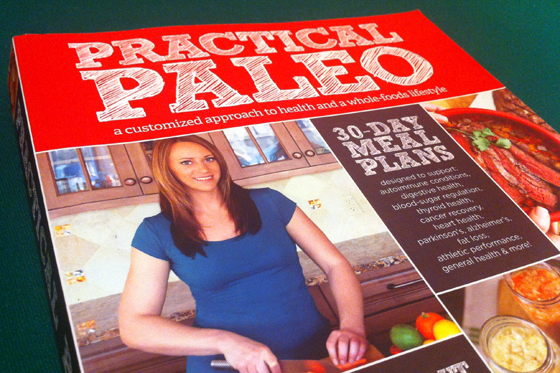 One of the recent books that has come out is “Practical Paleo,” written by Diane Sanfilippo, and what interested me about this book was that it’s got three major parts: 1) A break-down on how our digestive systems work, and how Paleo eating is the key to a healthy, strong body 2) Eating plans tailored to specific focuses, from autoimmunity to neurological health to fat loss 3) Recipes to use in the meal plans, and plenty of examples of how your favorite “non-Paleo” foods can be remade even better. Another great thing about this book is that it includes several guides to help you create a Paleo-friendly kitchen, like a guide to what “Paleo foods” are, how to stock a “Paleo pantry” and a guide food quality. One of the goals in Paleo eating is to fuel your body with not only whole foods (that you can consume as they are found in nature – think fresh vegetables and meats, not processed or packaged items), but to find the highest quality foods you can. The best choices are pasture-raised animals, but sometimes pasture-raised or grass-fed meats are not available, and it’s hard to know what the better choices are when the best is not available. The majority of the US meat supply unfortunately spends their lives cramped in feed lots. If you have not watched Food, Inc. yet, I say over and over in this blog that you need to, and I’ll say it again. Watch it NOW! There is much we can do as consumers to raise the level of quality in our food supply, and today is the best day to start. There really is a wealth of information in “Practical Paleo”, and if you’re at all interested in what Paleo or Primal eating is, and why it is important, I highly recommend this book as a starting point. There are more in-depth, scientific books out there, and there are like I said, there are fantastic cookbooks coming out now, but this is a great all-in-one reference, life approach, and cookbook that will help you learn more about how your body works, and how to fuel it to be your very best. A really comprehensive book. Thanks for lending it to me.